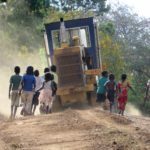 Balaka, 28 November 2018 – Bad roads coupled with long distances are fueling deaths of expectant mothers in Malawi with the 2015/2016 Demographic Health Survey (DHS) findings indicating that maternal mortality ratio is at 439 per 100,000 live births. While leaders insist that ‘no woman should die while giving life’ Malawi retains one of the highest maternal mortality ratios globally, currently estimated at 5.7 maternal deaths per 1,000 live births. Adolescent pregnancies comprise 25 percent of all births and 20 percent of maternal deaths. Balaka is one the districts that has poor road infrastructure with some of the public clinics in remote areas. It is a town situated about 145 kilometers north of the commercial hub, Blantyre where expectant mothers travel over 70 kilometers in some instances to get to the hospitals for health services. Mothers talk of how they deliver babies on the way to the hospital; and how some lose their lives on the way to give life. Malawi endorsed Sustainable Development Goals which among others talk highly of ‘Ensuring healthy lives and promoting the well-being of all ages which is essential to sustainable development’. Malawi’s Ministry of Health, subscribes to this year’s World Health Organization’s ‘Universal Health Coverage (UHC): Everyone, Everywhere’ a theme which ensures that everyone no matter where they live or who they are can access essential quality health services without being limited by financial hardship. It also ensures health for all, enhances health security, reduces poverty and promotes gender equality. The Malawi Health Sector Strategic Plan 2017-2022, which also encompasses UHC, outlines the health care interventions available to all Malawians. While Malawi boasts a well-organized health system that comprises health centers and dispensaries in communities and district hospitals and central hospitals at a higher level, ferrying patients from remote health centers to referral facilities can be a dreadful. In the rainy season (October-March), ambulances get stuck on earth roads putting the lives of expectant mothers and other patients at risk. Rose Festoni, 18, of Semani Village, Traditional Authority Nkaya in Balaka district recalls how she nearly lost her life because the ambulance that had come to pick her to the referral hospital got stuck in mud for hours before the community came to assist. Festoni says when her pregnancy was due she went to Phimbi Health Center anticipating that she would be assisted and eventually deliver at the facility. But the unexpected happened. She waited for three days at the clinic without delivering. She was referred to Balaka district hospital on the third day. An ambulance was dispatched to the dispensary to pick Festoni. A trip that normally takes one hour, took five hours on the 60-kilometre earth road. “My mother who was my guardian and several of my relatives were worried that we would be traveling to Balaka bearing in mind that such trips in the past resulted in expectant mothers losing their lives and that of their babies,” Festoni told Gender Links. Since it was in the rainy season, when most country roads are slippery and impassable, the ambulance struggled to get to Balaka. Festoni recalls that at some point the vehicle got stuck in the mud it took one and half hours to remove it from the mud. “Despite the pain I was in, I overheard members of the community sympathizing with me. They prayed that the ambulance be pulled out of the mud to save my life and that of my baby. By the grace of God the community did a good job and we were back on the road to the hospital where I delivered my baby,” Festoni says. Daudi concurs with her daughter that God’s hand delivered them from their fate. “For me, God was our driver that night. It was like a dream that the ambulance finally was pulled out of the mud and made it to Balaka district hospital. My daughter was able to deliver her baby. I was worried that I would lose my daughter and grandchild,” she said. Daudi says over the years she has seen expectant women delivering along the way to the hospital because the road to the hospital has been in bad condition for decades. She now wants government to intervene and do something on the road. “My plea to government is to upgrade this road. It is not only expectant women who are at risk of losing lives to the bad state of the roads, even those suffering from different diseases and are in critical conditions lose their lives on the way to hospitals,” Daudi says. Apart from expectant mothers, the ambulances also pick other cases that have been referred to the district hospitals. This was the case when Margaret Bitoni from Chisoni Village in Chief Nkaya’s area was referred to Balaka district hospital to deliver her second child. “I was referred to Balaka district hospital after my condition worsened at Phimbi Health Centre. On our way to the hospital we got stuck at Chitala Village. This stretch of the road is always in very bad state in the rainy season. After two hours of trying to remove the ambulance from the mud, I delivered right at the place because we could not make it to the district hospital in time. “I was lucky that there was a male medical personnel in the ambulance. However, he had travelled to Phimbi on another business. He is the one who assisted me to deliver. I am indebted to this man. In the absence of a nurse or medical doctor I was going to have some complications,” Bitoni explains. “The situation normalizes a bit in the dry season. At least in the dry season we are able to drive to the district hospital in one hour. In the rainy season it’s more than five hours in most cases,” Kapanda says. “They [office] openly tell me that it is not their problem. They say they are not responsible for the bad road,” Kapanda laments. Traditional leader of the area, Village Headman Chitala disclosed that the situation has been dire for many years. Chitala said expectant women are always at risk when they have been referred to the district hospital due to the bad road infrastructure in the area. “I have assisted more than 10 women to deliver right on the side of the road each time the ambulance gets stuck. My worry is that I assist these women to deliver without the necessary tools. This puts the lives of the mother and the newly born baby at risk as they can contract infections,” Chitala says. The traditional leader puts the blame on contractors who were contracted to upgrade the road to the gravel level. Chitala says they did a terrible job and nobody took them to task. “During the rainy season this road becomes a money maker for bicycle taxi operators. They charge from $7 to $10 from Phimbi to Balaka. That is too much for a villager. Government should do something on this road,” Chitala says. The National Roads Authority said there are regulations that are followed before a contractor is selected to work on a particular road. For people around Phimbi Health Centre ‘Ensuring healthy lives and promoting the well-being of all ages which is essential to sustainable development’ begins with a reliable road infrastructure, something they have been denied for decades.